i love google profiles, hope it grows steadily. world opener with google's deeds. a week reserved for watching, echoing with my girl. a week at watch.^this week i almost kept mute, abiding God's rule, and in favor of my girl zhou. it has been 2 days in sequence in brilliant sunshine, let me enjoyed flying with breeze so far. yesterday i visit baby as he lets, reinstalled his favorite game, "Cloudy.with.a.Chance.of.Meatballs", and some new games just got from web. when i arrived, he was writing his homework, and asked me to play the game on my own while he watched aside. he likely a bit reluctant to be attracted or immersed in the game. so cute&understandable child. he surely sensed the heavy load of competent among nowadays Chinese education. he is just can't be more smarter. after i finished games' setup, he started to play games. his mom, emakingir, cooked us remnant of their last meal, lamb chops, and its real lamb chops i almost first time ate, and really satisfied me. when i busy with backup dvds, fine tuned family sites' bookmarks against China surveillance, baby was brought by his mom haunted outside for sunburn. baby accepted my camera. baby's mom, emakingir, reluctant to shot photos, and indeed shot some photos in which baby's image all small. after they returned, i introduced new feature extension of google browser, chrome, to ema, and she gladly shown interest on domestic microblogs, even promised digging on them coming years. i then went to shower and haircut, both let me relaxed. bought baby sugar gourd&icecream. the grocer talked about deposit for their baby's higher education, which let me assured no one on the earth more glorious or richer than my baby son, warrenzh, owner of domain warozhu.com, Hope of China, God of Universe. when baby eating the gourd while watching animation online, i held him on my laptop and exchanged our view on Heaven, family duty, and our bandage. i at a rush to prepare leaving, but exact the moment with baby on my laptop, i felt the world so peaceful and boundless rich. on way to bus stop, God let me take taxi to return my dorm, and 2 taxies just porting on the bus stop which is empty. the taxi i picked equipped with a powerful audio system, which let me phrase it to the driver. in the restaurant i haunted several times recently for Chinese food, esp. rice, i was served a Japanese bean curd. the little restaurant changed owner, while the cook was remained. i promised to taste its new feature dish, fried ducks' heads, next time. this morning i got up around 9am, went to office at once. China surveillance sniffing my surfing more closely, any sites i visited need twice refresh before it appears. google was blocked but sometimes working again. baby's desktop strangely can't play online movies, but soon resumed to work when i directing baby's mom how to diagnose the problem on the phone. after the only meal near 4pm, i haunted outside for last sunshine of the day, also brought some orange for birds in the dorms area. the early spring urges more leisure people outside for refreshment. the full moon these days appears earlier than usual, assured me more closer my task here to my destiny. after i settled in dorm and started to log expense, God let me know i can blog again to satisfy my beloved, as well as my job here on the earth. its really lovable moment these days in a week. 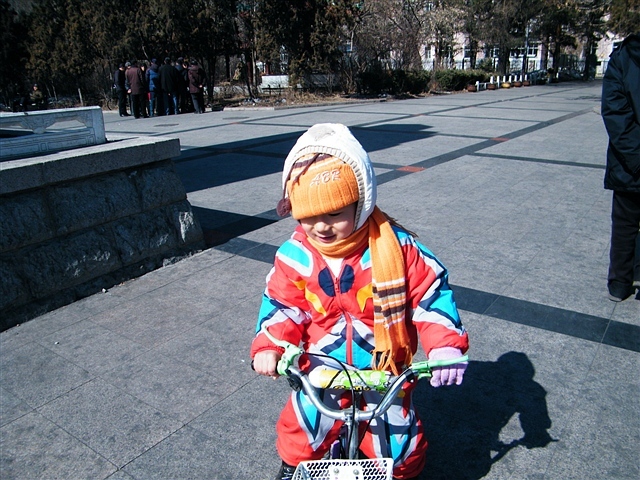 baby son, warrenzh, 朱楚甲(http://facebook.com/zhuchujia ), Hope of China, riding in Qiqihar southern park. baby son, warrenzh, 朱楚甲, talked with his mom, emakingir, in southern park at noon. 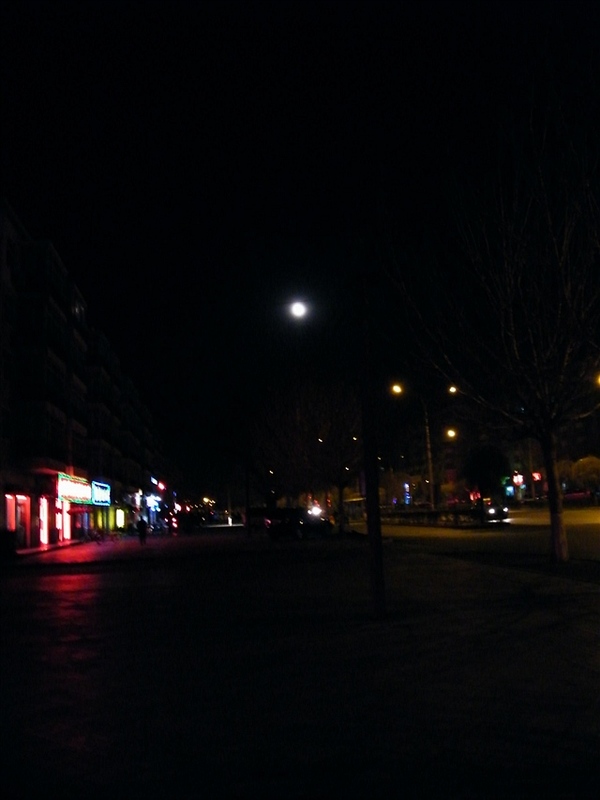 the full early moon, from view on QRRS main road, near benzrad's office. google apps has lots hideous functions to explore. Chinese social system full scale bankrupted. no credit among Chinese, nor among Chinese enterprise, which even worse than individual for the heavier shell of group. China as a society under current social political structure only a way leads out: total collapse. not easy a full user experience in decades with sns, but this is. not easy all one got full experience as a heavy user of digital social media online, but this one has his consolidate insight. that assures me, the future not on facebook, which closer cooperates with microsoft for easy money, but google, who with a dearer or cuter sense of civilian publication. the world belongs more to sharing and opening, belongs to democracy worldwide. the world belongs to education, non-profit, and common wealth. the world belongs to google which summon the peripherals in one goal: let information easy accessible, that's God's will&bliss for the world in troubles. Chinese native religion, Tsao, the same syllabus as theft, indicating its culture. Chinese these years' progress, no one don't based the resource of the open world, while its authority hated&tried its best to uncover the fact. now it besieged by due date it repent, and tumor of swallowing fruits un-nature, but its authority, the biggest and most brutal theft in the peaceful world, tried its best to kick on western corps in China&spilt dirty water on the painted scapegoat. "How China Is Playing Catchup With International Companies"
with google, the world of democracy&human right assured, without google, China shut down with its all business supporting puffing Chinese sooner than the sandstorm, the threat Beijing encountered. without the world google leads, China like the dying dynasty it lost hundreds ago again, like a real paper tiger which survives now in cage of its zoo. without world of western, China sin&sick, and sinks into abnormal&suicide sooner than opium war brought a century ago. China, essentially in a fate to repent. "Google，等你回来 March 20, 2010 – 9:09 pm"
kill bureaucracy, dog system that dominating nowadays China mainland. anyone cooperates with China authority nowadays, anyone down to hell. God saves the bright, including google. spreads God's message, unites world in one God's shine, that's source of forever power of Google. grows healthily google! for ur republic, is the future social architecture.